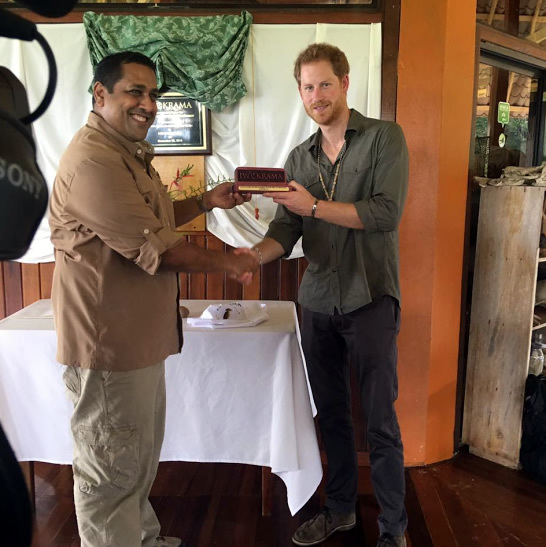 “Prince Harry’s presence at Iwokrama and Kaieteur shines focus on Guyana’s gifts to world” President David Granger. Before arriving at the reserve, Prince Harry visited Surama and made a brief stop at Fairview Village, where he met with residents, interacted with children and donated reading materials to the village’s school and children. At Iwokrama, he was welcomed by CEO, Mr. Dane Gobin and team and was given a brief presentation on our conservation work. Steps taken to protect this important forest, the growth rate and size of Greenheart tree, sustainable harvesting and the medicinal value of the greenheart seed were some of the areas discussed. He then unveiled a plaque in honour of his visit there and was taken on a tour to the River Lodge and walked down to the edge of famous Essequibo River flowing by while ‘Sankar’, our resident caiman put on a grand show for his royal highness. President David Granger believes that Prince Henry of Wales, popularly known as Prince Harry, enjoyed Guyana’s wealth of natural beauty on his visit to Kaieteur National Park, Surama Village and particularly the flag ship of Guyana’s ‘green’ state agenda, the Iwokrama International Centre for Rainforest Conservation and Development, that he is placing the spotlight on the remarkable gift that Guyana has to offer the world. The President believes that his mere presence is a boost for both eco-tourism and conservation efforts locally.